Meat Mitch Whomp! 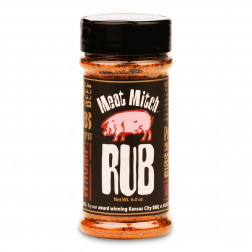 BBQ rubs and sauces are award-winning and undeniably delicious - Complete the championship flavor of your BBQ dishes by using Meat Mitch's BBQ rub. A BBQ rub that will enhance the flavor of any slab of meat you put it on: Beef, chicken, pork, anything! Try it today for championship results in your backyard. Meat Mitch BBQ rub has been gaining a steady following here at Big Poppa Smokers for it's combination of sweet and spicy flavors blended perfectly to enhance the flavor of any slab of meat. Try it today - you may discover your new perfect rib rub!